"Vermeer" redirects here. For other uses, see Vermeer (disambiguation). Johannes Vermeer (/vərˈmɪər/; Dutch: [joːˈɦɑnəs fərˈmeːr]; October 1632 – December 1675) was a Dutch Baroque Period painter who specialized in domestic interior scenes of middle-class life. He was a moderately successful provincial genre painter in his lifetime but evidently was not wealthy, leaving his wife and children in debt at his death, perhaps because he produced relatively few paintings. He was recognized during his lifetime in Delft and The Hague, but his modest celebrity gave way to obscurity after his death. He was barely mentioned in Arnold Houbraken's major source book on 17th-century Dutch painting (Grand Theatre of Dutch Painters and Women Artists), and was thus omitted from subsequent surveys of Dutch art for nearly two centuries. In the 19th century, Vermeer was rediscovered by Gustav Friedrich Waagen and Théophile Thoré-Bürger, who published an essay attributing 66 pictures to him, although only 34 paintings are universally attributed to him today. Since that time, Vermeer's reputation has grown, and he is now acknowledged as one of the greatest painters of the Dutch Golden Age. Like some major Dutch Golden Age artists such as Frans Hals and Rembrandt, Vermeer never went abroad. And like Rembrandt, he was an avid art collector and dealer. Relatively little was known about Vermeer's life until recently. He seems to have been devoted exclusively to his art, living out his life in the city of Delft. Until the 19th century, the only sources of information were some registers, a few official documents, and comments by other artists; for this reason, Thoré-Bürger named him "The Sphinx of Delft". John Michael Montias added details on the family from the city archives of Delft in his Artists and Artisans in Delft: A Socio-Economic Study of the Seventeenth Century (1982). Johannes Vermeer was baptized within the Reformed Church on 31 October 1632. [Note 1] His father Reijnier Janszoon was a middle-class worker of silk or caffa (a mixture of silk and cotton or wool). [Note 2] As an apprentice in Amsterdam, Reijnier lived on fashionable Sint Antoniesbreestraat, a street with many resident painters at the time. In 1615, he married Digna Baltus. The couple moved to Delft and had a daughter named Geertruy who was baptized in 1620. [Note 3] In 1625, Reijnier was involved in a fight with a soldier named Willem van Bylandt who died from his wounds five months later. Around this time, Reijnier began dealing in paintings. In 1631, he leased an inn, which he called "The Flying Fox". In 1635, he lived on Voldersgracht 25 or 26. In 1641, he bought a larger inn on the market square, named after the Flemish town "Mechelen". The acquisition of the inn constituted a considerable financial burden. [Huerta 1] When Vermeer's father died in October 1652, Vermeer took over the operation of the family's art business. The influence of Johannes Vermeer on Metsu is unmistakable: the light from the left, the marble floor. (A. Waiboer, however, suggests that Metsu requires more emotional involvement of the viewer.) Vermeer probably competed also with Nicolaes Maes, who produced genre works in a similar style. In 1662, Vermeer was elected head of the guild and was reelected in 1663, 1670, and 1671, evidence that he (like Bramer) was considered an established craftsman among his peers. Vermeer worked slowly, probably producing three paintings a year on order. Balthasar de Monconys visited him in 1663 to see some of his work, but Vermeer had no paintings to show. The diplomat and the two French clergymen who accompanied him were sent to Hendrick van Buyten, a baker who had a couple of his paintings as collateral. In 1671, Gerrit van Uylenburgh organised the auction of Gerrit Reynst's collection and offered 13 paintings and some sculptures to Frederick William, Elector of Brandenburg. Frederick accused them of being counterfeits and had sent 12 back on the advice of Hendrick Fromantiou. Van Uylenburg then organized a counter-assessment, asking a total of 35 painters to pronounce on their authenticity, including Jan Lievens, Melchior de Hondecoeter, Gerbrand van den Eeckhout, and Johannes Vermeer. 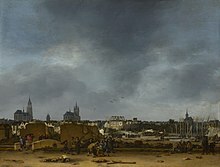 In 1672, a severe economic downturn (the "Year of Disaster") struck the Netherlands, after Louis XIV and a French army invaded the Dutch Republic from the south (known as the Franco-Dutch War). During the Third Anglo-Dutch War, an English fleet and two allied German bishops attacked the country from the east, causing more destruction. Many people panicked; courts, theaters, shops and schools were closed. Five years passed before circumstances improved. In 1674, Vermeer was listed as a member of the civic guards. In the summer of 1675, Vermeer borrowed 1,000 guilders in Amsterdam from Jacob Romboutsz, an Amsterdam silk trader, using his mother-in-law's property as a surety. ...during the ruinous war with France he not only was unable to sell any of his art but also, to his great detriment, was left sitting with the paintings of other masters that he was dealing in. As a result and owing to the great burden of his children having no means of his own, he lapsed into such decay and decadence, which he had so taken to heart that, as if he had fallen into a frenzy, in a day and a half he went from being healthy to being dead. Catharina Bolnes attributed her husband's death to the stress of financial pressures. The collapse of the art market damaged Vermeer's business as both a painter and an art dealer. She had to raise 11 children and therefore asked the High Court to relieve her of debts owed to Vermeer's creditors. [Montias 1] Dutch microscopist Antonie van Leeuwenhoek, who worked for the city council as a surveyor, was appointed trustee. The house had eight rooms on the first floor and was filled with paintings, drawings, clothes, chairs, and beds. In his studio, there were two chairs, two painter's easels, three palettes, 10 canvases, a desk, an oak pull table, a small wooden cupboard with drawers, and "rummage not worthy being itemized". [Montias 4] Nineteen of Vermeer's paintings were bequeathed to Catharina and her mother. The widow sold two more paintings to Hendrick van Buyten to pay off a substantial debt. Vermeer had been a respected artist in Delft, but he was almost unknown outside his hometown. A local patron named Pieter van Ruijven had purchased much of his output, which reduced the possibility of his fame spreading. [Note 11] Several factors contributed to his limited body of work. Vermeer never had any pupils, so there was no school of Vermeer. His family obligations with so many children may have taken up much of his time, as would acting as both an art-dealer and inn-keeper in running the family businesses. His time spent serving as head of the guild and his extraordinary precision as a painter may have also limited his output. 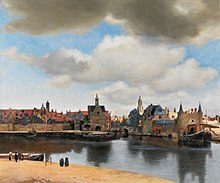 Vermeer may have first executed his paintings tonally like most painters of his time, using either monochrome shades of grey ("grisaille") or a limited palette of browns and greys ("dead coloring"), over which he would apply more saturated colors (reds, yellows and blues) in the form of transparent glazes. No drawings have been positively attributed to Vermeer, and his paintings offer few clues to preparatory methods. There is no other 17th-century artist who employed the exorbitantly expensive pigment lapis lazuli (natural ultramarine) either so lavishly or so early in his career. Vermeer used this in not just elements that are naturally of this colour; the earth colours umber and ochre should be understood as warm light within a painting's strongly lit interior, which reflects its multiple colours onto the wall. In this way, he created a world more perfect than any he had witnessed. [Liedtke 3] This working method most probably was inspired by Vermeer’s understanding of Leonardo’s observations that the surface of every object partakes of the colour of the adjacent object. This means that no object is ever seen entirely in its natural colour. A comparable but even more remarkable, yet effectual, use of natural ultramarine is in The Girl with the Wine Glass. The shadows of the red satin dress are underpainted in natural ultramarine, and, owing to this underlying blue paint layer, the red lake and vermilion mixture applied over it acquires a slightly purple, cool and crisp appearance that is most powerful. Even after Vermeer’s supposed financial breakdown following the so-called rampjaar (year of disaster) in 1672, he continued to employ natural ultramarine generously, such as in Lady Seated at a Virginal. This could suggest that Vermeer was supplied with materials by a collector, and would coincide with John Michael Montias’ theory that Pieter van Ruijven was Vermeer’s patron. Vermeer's works are largely genre pieces and portraits, with the exception of two cityscapes and two allegories. His subjects offer a cross-section of seventeenth-century Dutch society, ranging from the portrayal of a simple milkmaid at work, to the luxury and splendour of rich notables and merchantmen in their roomy houses. Besides these subjects, religious, poetical, musical, and scientific comments can also be found in his work. One aspect of his meticulous painting technique was Vermeer's choice of pigments. He is best known for his frequent use of the very expensive ultramarine (The Milkmaid), and also lead-tin-yellow (A Lady Writing a Letter), madder lake (Christ in the House of Martha and Mary), and vermilion. He also painted with ochres, bone black and azurite. The claim that he utilized Indian yellow in Woman Holding a Balance has been disproven by later pigment analysis. In Vermeer’s oeuvre, only about 20 pigments have been detected. Of these 20 pigments, seven principal pigments which Vermeer commonly employed include lead white, yellow ochre, vermilion, madder lake, green earth, raw umber, and ivory or bone black. Vermeer's painting techniques have long been a source of debate, given their almost photorealistic attention to detail, despite Vermeer's having had no formal training, and despite only limited evidence that Vermeer had created any preparatory sketches or traces for his paintings. In 2001, British artist David Hockney published the book Secret Knowledge: Rediscovering the Lost Techniques of the Old Masters, in which he argued that Vermeer (among other Renaissance and Baroque artists including Hans Holbein and Diego Velázquez) used optics to achieve precise positioning in their compositions, and specifically some combination of curved mirrors, camera obscura, and camera lucida. This became known as the Hockney–Falco thesis, named after Hockney and Charles M. Falco, another proponent of the theory. Professor Philip Steadman published the book Vermeer's Camera: Uncovering the Truth behind the Masterpieces in 2001 which specifically claimed that Vermeer had used a camera obscura to create his paintings. Steadman noted that many of Vermeer's paintings had been painted in the same room, and he found six of his paintings that are precisely the right size if they had been painted from inside a camera obscura in the room's back wall. Supporters of these theories have pointed to evidence in some of Vermeer's paintings, such as the often-discussed sparkling pearly highlights in Vermeer's paintings, which they argue are the result of the primitive lens of a camera obscura producing halation. It was also postulated that a camera obscura was the mechanical cause of the "exaggerated" perspective seen in The Music Lesson (London, Royal Collection). In 2008, American entrepreneur and inventor Tim Jenison developed the theory that Vermeer had used a camera obscura along with a "comparator mirror", which is similar in concept to a camera lucida but much simpler and makes it easy to match color values. He later modified the theory to simply involve a concave mirror and a comparator mirror. He spent the next five years testing his theory by attempting to re-create The Music Lesson himself using these tools, a process captured in the 2013 documentary film Tim's Vermeer. Several points were brought out by Jenison in support of this technique: First was Vermeer's hyper-accurate rendition of light falloff along the wall. Neurobiologist Colin Blakemore, in an interview with Jenison, notes that human vision cannot process information about the absolute brightness of a scene. Another was the addition of several highlights and outlines consistent with matching the effects of chromatic aberration, particularly noticeable in primitive optics. Last, and perhaps most telling, is a noticeable curvature in the original painting's rendition of the scrollwork on the harpsichord. This effect matched Jenison's technique precisely, caused by exactly duplicating the view as seen from a curved mirror. This theory remains disputed. There is no historical evidence regarding Vermeer's interest in optics, aside from the accurately observed mirror reflection above the lady at the virginals in The Music Lesson. The detailed inventory of the artist's belongings drawn up after his death does not include a camera obscura or any similar device. However, Vermeer was in close connection with pioneer lens maker Antonie van Leeuwenhoek and Leeuwenhoek was his executor after death. Vermeer produced a total of fewer than 50 paintings, of which 34 have survived. Only three Vermeer paintings are dated: The Procuress (1656; Gemäldegalerie, Dresden); The Astronomer (1668; Musée du Louvre, Paris); and The Geographer (1669; Städelsches Kunstinstitut, Frankfurt). Vermeer's mother-in-law Maria Thins owned Dirck van Baburen's 1622 oil-on-canvas The Procuress (or a copy of it), which appears in the background of two of Vermeer's paintings. The same subject was also painted by Vermeer. Almost all of Vermeer's paintings are of contemporary subjects in a smaller format, with a cooler palette dominated by blues, yellows, and grays. Practically all of his surviving works belong to this period, usually domestic interiors with one or two figures lit by a window on the left. They are characterized by a sense of compositional balance and spatial order, unified by a pearly light. Mundane domestic or recreational activities are imbued with a poetic timelessness (e.g., Girl Reading a Letter at an Open Window, Dresden, Gemäldegalerie). Vermeer's two townscapes have also been attributed to this period: View of Delft (The Hague, Mauritshuis) and A street in Delft (Amsterdam, Rijksmuseum). A few of his paintings show a certain hardening of manner and are generally thought to represent his late works. From this period come The Allegory of Faith (c. 1670; Metropolitan Museum of Art, New York) and The Love Letter (c. 1670; Rijksmuseum, Amsterdam). Vermeer's works were largely overlooked by art historians for two centuries after his death. A select number of connoisseurs in the Netherlands did appreciate his work, yet even so, many of his works were attributed to better-known artists such as Metsu or Mieris. The Delft master's modern rediscovery began about 1860, when German museum director Gustav Waagen saw The Art of Painting in the Czernin gallery in Vienna and recognized the work as a Vermeer, though it was attributed to Pieter de Hooch at that time. Research by Théophile Thoré-Bürger culminated in the publication of his catalogue raisonné of Vermeer's works in the Gazette des Beaux-Arts in 1866. Thoré-Bürger's catalogue drew international attention to Vermeer and listed more than 70 works by him, including many that he regarded as uncertain. The accepted number of Vermeer's paintings today is 34. Upon the rediscovery of Vermeer's work, several prominent Dutch artists modelled their style on his work, including Simon Duiker. 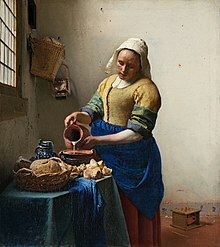 Other artists who were inspired by Vermeer include Danish painter Wilhelm Hammershoi and American Thomas Wilmer Dewing. In the 20th century, Vermeer's admirers included Salvador Dalí, who painted his own version of The Lacemaker (on commission from collector Robert Lehman) and pitted large copies of the original against a rhinoceros in some surrealist experiments. Dali also immortalized the Dutch Master in The Ghost of Vermeer of Delft Which Can Be Used As a Table, 1934. Han van Meegeren was a 20th-century Dutch painter who worked in the classical tradition. He became a master forger, motivated by a blend of aesthetic and financial reasons, creating and selling many new "Vermeers" before being caught and tried. His dizziness increased; he fixed his gaze, like a child upon a yellow butterfly that it wants to catch, on the precious patch of wall. "That's how I ought to have written," he said. "My last books are too dry, I ought to have gone over them with a few layers of colour, made my language precious in itself, like this little patch of yellow wall....." In a celestial pair of scales there appeared to him, weighing down one of the pans, his own life, while the other contained the little patch of wall so beautifully painted in yellow. He felt that he had rashly sacrificed the former for the latter.... A fresh attack struck him down.... He was dead. A Vermeer painting plays a key part of the dénouement in Agatha Christie's After the Funeral (1953). Susan Vreeland's novel Girl in Hyacinth Blue follows eight individuals with a relationship to a painting of Vermeer. The young adult novel Chasing Vermeer by Blue Balliett centers on the fictional theft of Vermeer's A Lady Writing. J. P. Smith's novel The Discovery of Light deals largely with Vermeer. The character of Barney in Thomas Harris's novel Hannibal (1999) has a goal to see every Vermeer painting in the world before he dies. In 1978 the American science fiction author Gordon Eklund published a short story "Vermeer's Window" in the magazine Universe 8, about an aspiring artist who is given the ability to reproduce Vermeer's works. The 1981 movie Arthur starring Dudley Moore has a scene about 32 minutes into the film where Arthur's grandmother opens a Vermeer painting that she has just purchased. In the film, the grandmother calls the painting "Woman Admiring Pearls", but it is actually called Woman with a Pearl Necklace. Peter Greenaway's film A Zed & Two Noughts (1985) features an orthopedic surgeon named Van Meegeren who stages highly exact scenes from Vermeer paintings in order to paint copies of them. John Jost's film All the Vermeers in New York (1990) makes reference to a woman's resemblance to a Vermeer painting. Dutch composer Louis Andriessen based his opera Writing to Vermeer (1997–98, libretto by Peter Greenaway) on the domestic life of Vermeer. Brian Howell's novel The Dance of Geometry (Toby Press, 2004) narrates four interlinking episodes that centre around the creation of Vermeer's The Music Lesson, dealing with his childhood and courtship of his wife-to-be, a visit by a French traveller who becomes involved in the final stages of the work and its tragic end, a modern copyist's deliberations on the importance of the work in his life, and the final stages of Vermeer's life. Tracy Chevalier's novel Girl with a Pearl Earring (1999) and the film of the same name (2003) present a fictional account of Vermeer's creation of the famous painting and his relationship with the equally fictional model. The film was nominated for Oscars in cinematography, art direction, and costume design. Vermeer in Bosnia (2004) is a collection of essays by Lawrence Weschler. The title essay is a meditation on the relationship between Vermeer's paintings in the Mauritshuis in The Hague and the events being recounted in the Yugoslav War Crimes Tribunal in the same city. The song "No One Was Like Vermeer" from the 2008 album Because Her Beauty Is Raw and Wild by Boston singer-songwriter Jonathan Richman pays tribute to Vermeer's painstaking technique. Richman also references Vermeer in his song "Vincent Van Gogh" and both songs are frequently part of Richman's live performances. Historian Timothy Brook's Vermeer's Hat: The Seventeenth Century and the Dawn of the Global World (2007) examines six of Vermeer's paintings for evidence of world trade and globalization during the Dutch Golden Age. "Jan Vermeer" is a rockabilly song written by Bob Walkenhorst for his solo album The Beginner. 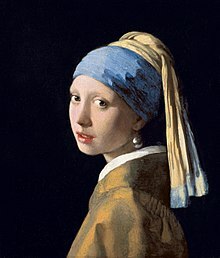 David Olney's song "Mister Vermeer" on his 2010 album Dutchman's Curve imagines Vermeer's unrequited love for the subject of Girl with a Pearl Earring. The 2013 documentary film Tim's Vermeer follows inventor Tim Jenison's examination on his theory that Vermeer used optical devices to assist in generating his realistic images. ^ In the 17th century, Johannes was a popular name, and spelling was not consistent. The name could be spelled in the Dutch (Johan or Johannes), French (Joan), Italian (Giovanni), Greek (Johannis), or other style depending on background, education, or family tradition. ^ His name was Reijnier or Reynier Janszoon, always written in Dutch as Jansz. or Jansz; this was his patronym. As there was another Reijnier Jansz at that time in Delft, it seemed necessary to use the pseudonym "Vos", meaning Fox. From 1640 onward, he had changed his alias to Vermeer. ^ In 1647 Geertruy, Vermeer's only sister, married a frame maker. She kept on working at the inn helping her parents, serving drinks and making beds. ^ Catholicism was not a forbidden religion, but tolerated in the Dutch Republic. They were not allowed to build new churches, so services were held in hidden churches (so-called Schuilkerk). Catholics were restrained in their careers, unable to get high-ranking jobs in city administration or civic guard. It was impossible to be elected as a member of the city council; therefore, the Catholics were not represented in the provincial and national assembly. ^ A Roman Catholic chapel now exists at this spot. ^ The parish registers of the Delft Catholic church do not exist anymore, so it is impossible to prove but likely that his children were baptized in a hidden church. ^ The number of children seems inconsistent, but 11 was stated by his widow in a document to get help from the city council. One child died after this document was written. ^ He was baptized as Joannis, but buried under the name Jan.
^ When Catharina Bolnes was buried in 1688, she was registered as the "widow of Johan Vermeer". ^ Van Ruijven's son-in-law Jacob Dissius owned 21 paintings by Vermeer, listed in his heritage in 1695. These paintings were sold in Amsterdam the following year in a much-studied auction, published by Gerard Hoet. ^ "The Procuress: Evidence for a Vermeer Self-Portrait". Retrieved 13 September 2010. ^ a b Jonathan Janson, Essential Vermeer: complete Vermeer catalogue; accessed 16 June 2010. ^ "Vermeer". Random House Webster's Unabridged Dictionary. ^ In isolation, Vermeer is pronounced [vərˈmeːr]. ^ "Jan Vermeer". The Bulfinch Guide to Art History. Artchive. Retrieved 21 September 2009. ^ "An Interview with Jørgen Wadum". Essential Vermeer. 5 February 2003. Retrieved 21 September 2009. ^ Koningsberger, Hans. 1977. The World of Vermeer, New York: Time-Life Books, p. ? ^ Barker, Emma; et al. (1999). The Changing Status of the Artist. New Haven: Yale University Press. p. 199. ISBN 0-300-07740-8. Retrieved 2012-04-19. ^ "Vermeer the Man and Painter". Essential Vermeer. Retrieved 10 April 2014. ^ "Vermeer: A View of Delft". The Economist. 1 April 2001. Archived from the original on 5 November 2012. Retrieved 21 September 2009. ^ "Vermeer's Name". Essential Vermeer. Retrieved 21 September 2009. 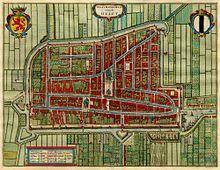 ^ "Digital Family Tree of the Municipal Records Office of the City of Delft". Beheersraad Digitale Stamboom. 2004. Archived from the original on 23 February 2013. Retrieved 21 September 2009. The painter is recorded as: Child=Joannis; Father=Reijnier Jansz; Mother=Dingnum Balthasars; Witnesses=Pieter Brammer, Jan Heijndricxsz, Maertge Jans; Place=Delft; Date of baptism=31 October 1632. ^ John Michael Montias (1989). Vermeer and His Milieu: A Web of Social History. Princeton University Press. p. 83. ^ Liedtke, Walter; Plomp, Michiel C.; Rüger, Axel (2001). Vermeer and the Delft school: [catalogue ... in conjunction with the exhibition "Vermeer and the Delft School" held at The Metropolitan Museum of Art, New York, from 8 March to 27 May 2001, and at The National Gallery, London, from 20 June to 16 September 2001]. New Haven: Yale University Press. p. 359. ISBN 0870999737. ^ "Johannes Vermeer: Allegory of the Catholic Faith (32.100.18) | Heilbrunn Timeline of Art History | The Metropolitan Museum of Art". Metmuseum.org. 20 July 2012. Retrieved 24 July 2012. ^ "Vermeer biography". National Gallery of Art. Retrieved 21 September 2009. ^ Nash, J.M. (1972). The age of Rembrandt and Vermeer: Dutch painting in the seventeenth century. New York: Holt, Rinehart, and Winston. p. 40. ISBN 9780030918704. ^ Andrew Graham-Dixon, The Madness of Vermeer, BBC Four. ^ Adriaan E. Waiboer, Gabriel Metsu (1629–1667): Life and Work, PhD dissertation, New York University, School of Fine Arts, 2007: ProQuest, pp. 225–30. ^ "Curator in the spotlight: Adriaan E. Waiboer, National Gallery of Ireland, Dublin", Codart, retrieved 12 September 2014. ^ Susan Stamberg, "Gabriel Metsu: The Dutch Master You Don't Know", Morning Edition, NPR, 18 May 2011. ^ Montias (1989). Vermeer and His Milieu. p. 207. Retrieved 19 April 2012. ^ "Vermeer's Delft Today: Schutterij and the Doelen", Essential Vermeer. ^ Montias (1989), Vermeer and His Milieu, p. 337. ^ "A Postscript on Vermeer and His Milieu", Auteur: John Michael Montias, Uitgever: Uitgeverij Atlas Contact B.V.
^ Quoted from "Vermeer's Life and Art (part four)", Essential Vermeer. ^ Montias (1989), Vermeer and His Milieu, p. 217. ^ Janson, Jonathan. "Vermeer's Palette". Essential Vermeer. Retrieved 19 March 2017. ^ Steadman, Philip. "Vermeer and the Camera Obscura". BBC. Archived from the original on 29 November 2010. Retrieved 17 October 2010. ^ Andersen, Kurt (29 November 2013). "Reverse-Engineering a Genius (Has a Vermeer Mystery Been Solved?)". Vanity Fair. Archived from the original on 30 November 2013. ^ "Vermeer and the Camera Obscura". Essential Vermeer 2.0. Archived from the original on 25 September 2014. Retrieved 30 July 2014. ^ Bryson, Bill (2014). A Short History of Nearly Everything. Lulu Press. ISBN 1312792566. Retrieved 13 December 2015. ^ "Vermeer was brilliant, but he was not without influences". The Economist. 12 October 2017. ^ Gaskell, Jonker & National Gallery of Art (1998). Vermeer Studies, pp. 19–20. ^ a b Gaskell, Jonker & National Gallery of Art (1998). Vermeer Studies, p. 42. ^ "Interpretive Resource: Artist Biography: Thomas Wilmer Dewing". Artic.edu. Retrieved 10 April 2014. ^ Anthony Julius (22 June 2008). "The Lying Dutchman". The New York Times. Retrieved 19 April 2012. ^ Janson, Jonathan. "Vermeer Thefts: The Love Letter". www.essentialvermeer.com. Retrieved 2017-12-10. ^ "Girl with a Pearl Earring (2003) Awards". IMDb.com. 10 January 2005. Retrieved 3 October 2015. ^ "Triangulation 118". Twit.Tv. Retrieved 10 April 2014. ^ W. Liedtke, p. 893. ^ W. Liedtke, p. 866. ^ W. Liedtke, p. 867. Montias, John Michael (1991). Vermeer and His Milieu: A Web of Social History (reprint, illustrated ed.). Princeton University Press. ISBN 978-0-691-00289-7. ^ a b pp. 344–345. Kreuger, Frederik H. (2007). New Vermeer, Life and Work of Han van Meegeren. Rijswijk: Quantes. pp. 54, 218 and 220 give examples of Van Meegeren fakes that were removed from their museum walls. Pages 220/221 give an example of a non-Van Meegeren fake attributed to him. ISBN 978-90-5959-047-2. Archived from the original on 29 August 2010. Retrieved 21 September 2009. Sheldon, Libby; Nicola Costaros (February 2006). "Johannes Vermeer's 'Young woman seated at a virginal". The Burlington Magazine (vol. CXLVIII ed.) (1235). Snyder, Laura J. (2015). Eye of the Beholder: Johannes Vermeer, Antoni van Leeuwenhoek, and the Reinvention of Seeing. New York: W. W. Norton. ISBN 978-0-393-07746-9. Steadman, Philip (2002). Vermeer's Camera, the truth behind the masterpieces. Oxford University Press. ISBN 0-19-280302-6. Wadum, J. (1998). "Contours of Vermeer". In I. Gaskel and M. Jonker. Vermeer Studies. Studies in the History of Art. Washington/New Haven: Center for Advanced Study in the Visual Arts, Symposium Papers XXXIII. pp. 201–223. Wheelock, Arthur K., Jr. (1988) [1st. Pub. 1981]. Jan Vermeer. New York: Abrams. ISBN 0-8109-1737-8. Wikimedia Commons has media related to Johannes Vermeer.